Last night, we tried something new. We asked our current Twitter followers what their top pick is right now for an investment. The answer? Rockshield Capital Corp (CSE: RKS). Rockshield Capital is a company that we noticed has had a growing following on social media, which is largely a result of their investments in two popular sectors right now. It didn’t come as much of a surprise to us when they were the most frequent answer to our question. For those that are unaware, Rockshield Capital Corp is a venture capital firm that focuses on four sectors for investment: healthcare, resources, cannabis, and blockchain. The latter two of which have had an increasing focus from the investment firm as of late, which is a direct result of the bull market engulfing the two sectors currently. Lets get you up to speed on this company through a quick high level overview. As was just mentioned, Rockshield has holdings that span four sectors at the current point in time. In total, according to their website they have investments and cash totaling roughly $15 million which is spread across twenty different companies. Some of these companies are in very early stages, such as their seed round, while others have become more developed since the company’s first initial investment. Due to this, there’s roughly an even split among private and public companies that Rockshield Capital holds investments in. To expand upon these investment figures, the company has released some degree of information on fifteen of its current investments. This data is largely collected from news releases issued from as early as November 3, 2017. Although the company has been active as a publicly traded investment firm since 2014, it only recently began informing investors what exactly it was invested in. Prior to the operational update that was issued on this date, the most recent news release was from a year prior. Essentially, there was a change in strategy that clearly occurred within the company. 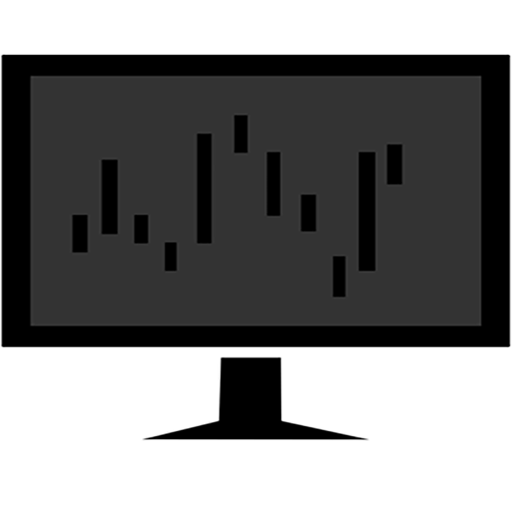 As a result of this change, they have become more open with company holdings and their entry price points. This change, in short, has directly resulted in an increase in their share price. Part of the reason behind this is within this operational update it indicated that the net asset value on a per share basis was $0.33. With the current share price sitting at $0.18 at the time, there was an 83% upside for investors just to get to par value for the equity. Based on a share count of 45,912,855 during the time of this release, it gave the company a net asset value of $15,151,242.15. Meanwhile, at this point in time the market cap was almost half this figure at $8.2 million. Currently, Rockshield Capital’s largest holding is within the healthcare sector with the company Helius Medical Technologies. This holding alone represented 55% of the companies holdings as of the latest financials, which were filed for August 31, 2017. However, an increasing emphasis has been placed on the cannabis and blockchain sector by the company. And truth be told, this is what has drawn most new investors in. We did our best to compile a comprehensive list of Rockshield’s current investments, and the value associated with them. To do so, we scoured all news releases issued by the company and any related documents. Its website is rather sparse when it comes to investment data, as is their filings. As a result, we have varying degrees of data on fifteen out of the company’s twenty investments. Estimated holdings of Rockshield Capital Corp as of January 24, 2018. In total, we were able to come to an estimated value that is roughly half of what was given in the companies latest update. However, this figure is based on full details for seven out of its stated investment count of twenty. The company also mentions that it has investments in several publicly listed companies from which we could gather pricing data on, however they opted to not provide share count data on many of these. Due to this, we know that the company is likely in the green on several investments, such as Emblem Corp and Big Wind Capital. We just don’t have solid figures to provide to you at this time. It should also be noted that within our chart, we assumed all warrants would be excerised that the company owned. As such, this was factored in to our cost basis. In terms of the company’s NAV, It is highly likely that the net asset value has increased from $0.33 per share since the latest operational update. This assumption is based on the fact that many of the companies investments are within the cannabis and blockchain sector, both of which have seen excessive bullish action since the beginning of November. The debt situation at Rockshield Capital is unlike anything typically seen on junior exchanges, and its something investors need to be absolutely aware of. That’s because its non existent. Hard to believe for a small cap company, isn’t it? The company has managed to avoid almost any debt through smart investment decisions. Additionally, it has also opted to not utilize the power of margin, which reduces its downside risk in the event of an equity’s share price collapsing. 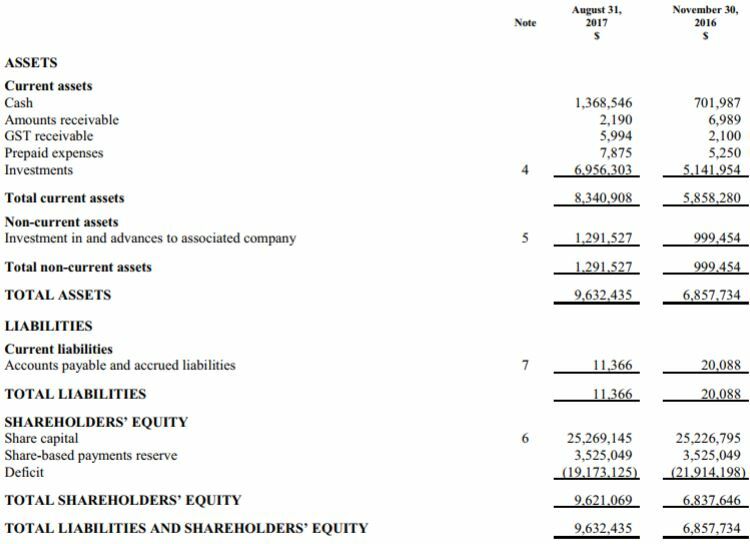 The balance sheet of Rockshield Capital as of August 31, 2017. The minuscule $11,366 that the company reported in liabilities within its most recent interim financials are truly dwarfed by a total asset valuation of $8.3 million. Based on the cash position at the time of $1.36 million, there was little concern for how the company would pay its bills. This is not something that we see often when looking at company financials on the Canadian junior exchanges, especially on a stock that has connections to the cannabis sector. Also of note, is the listed investment value of $7 million. When the company provided its operational update two months after this point in time, that figure had more than doubled to be over $15.1 million. With little information on how this occurred, it’ll be interesting to see the next set of company financials. No raise was performed within this time frame, and the company has no derivatives from which it can obtain capital. This is solely from the workings of increased asset valuation. Overall, we like what we see at Rockshield Capital Corp at this point in time. Although its curious as to what caused the company to visibly change its investor relations strategy at the beginning of November, it has clearly worked in their favour. The stock has been on an overall winning streak for close to a month now as investors discover what it has to offer. Certainly, it comes from a strong financial position at this time which is rare among stocks on the Canadian Securities Exchange. If you didn’t notice, we didn’t touch much on the share structure of this company which is unusual for us. However, there was little to say. At present, the company has roughly 47 million shares outstanding. In addition to this, is absolutely zero outstanding warrants, and zero options. Again, something that is odd for any stock on a junior exchange. That being said we have seen documents that point to a raise being currently underway that has yet to be officially announced. Rockshield Capital Corp is certainly a standout company within the sector. It offers access to companies that can’t be reached by the common investor, while offering this access at a low price per share with a tight share structure. Investment funds offer up a separate set of risks however that also needs to be taken into account when investing, such as the risk that these private investments can’t be liquidated effectively, or that they carry a false value. At the end of the day, its up to the individual to determine whether the potential benefit outweighs the potential risk. Find the companies that set themselves apart from the sector. Dive Deep. Information for this analysis was found via Sedar, The CSE, SEDI, and Rockshield Capital Corp. The author has no securities or affiliations related to this organization. Not a recommendation to buy or sell. Always do additional research and consult a professional before purchasing a security. BRIEF: Global Remote Technologies – Seriously, what?